Are you finding yourself struggling with low energy in the middle of the day? 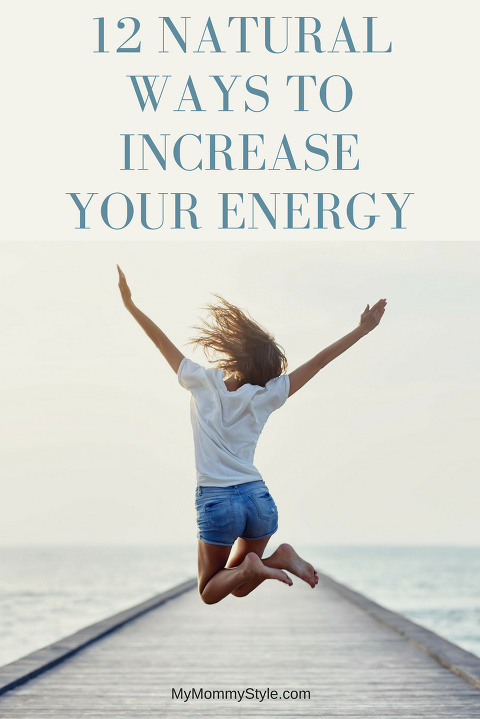 These natural ways to increase energy will give you the boost you need to make it through your day. Forget the mid-afternoon fatigue, you are now feeling it at ten in the morning most days. Between work, driving the kids to school and practices, and running a hundred errands, you need all the energy you can get. Luckily, there are some natural, healthy habits you can add into your routine to help those energy levels soar, without bringing in those unwanted crashes. Adding foods like almonds, hazelnuts, cashews, whole grains, and halibut into your regular diet can help your body to have enough stores of this important mineral. Magnesium is necessary for the breakdown of glucose into energy. When it comes to the famously important meal, make sure you are choosing high carbohydrate and high fiber options. The carbohydrate will give your body the initial kick start your body needs, while the fiber will help you feel full longer. Try this peanut butter berry oatmeal recipe. Avoid breakfasts that are only comprised of carbohydrates, as these will leaving you feeling hungry and tired much more quickly. These healthy breakfast ideas are great too! Avoid drinking alcohol, soda, and energy drinks. While they may help you feel better for a short bit, they often leave you dehydrated and lethargic. Replace these drinks with water to keep yourself well hydrated. At a minimum, you should be drinking eight, 8 oz. glasses per day. Staying hydrated will help your body to keep up the energy and reduce fatigue. We love this water bottle. Also check out these 20 important reasons to drink more water. ust because you eat a good breakfast, does not give you liberty to slack on your other meals throughout the day. As you eat regularly, you will be able to keep your blood sugar levels up, giving you more energy. If you are struggling with the drive thru at lunch time consider doing some meal prep at the beginning of the week with these great meal prep bowl ideas! Along with meals, eat some power packed snacks between meals. Make sure they include a complex carbohydrate and a protein, to get that effect of quick, but sustained energy. Try combinations such as greek yogurt with granola, whole wheat crackers with cheese, or whole wheat toast with peanut butter. We like to make hard boiled eggs in the Instant Pot and have them available in the fridge for a quick punch of protein. We also really like these protein granola bites. Whether this means starting a new workout routine, or simply taking the time to go for a short walking break during the workday, adding to your physical activity routine can do wonders for your energy levels. Just 10 minutes of walking per day can help drive away the midday yawns. Believe it or not, studies have shown that taking short breaks while working (as little as 14 seconds) can have an effect on your energy levels. One study in particular even showed these short breaks add to the productivity of the workplace. Use this time to stretch, have a quick chat, or refill your water bottle. Nap time is not something that should have stopped after the preschool days. Taking a short nap can help you to feel refreshed and in the long run, gives you the energy to perform your duties the rest of the day more efficiently. Be sure that your nap does not last longer than one hour to avoid the opposite of the desire effect. If you are feeling sleepy, try completing a puzzle. Challenging puzzles help to stimulate brain cells and help you stay alert. Stress is the number one culprit to low energy levels, so the more you can do to manage your stress levels, the more you will be able to see your energy levels increase. Try taking time for meditation, yoga, or breathing exercises throughout your day. As you reach for foods to give you a little pick me up, avoid simple sugars like those found in candy, white breads, and pastas. Also steer clear of trans-fats found in donuts, french fries, and chips. These foods may help for a bit, as they cause your blood sugar to spike, but they cause a steep crash shortly afterward. Focus more on whole grains, fiber, and lean protein options. Being around negative people can quite literally drain you of your energy. Do your best to surround yourself with positive influences and you will see your energy levels increase. A happy, active social life is one of the secrets to adding energy to your life.